Teaching algorithms in Year 1 | Blog My Wiki! There have been many challenges in my new role as a primary school Digital Learning Co-ordinator: teaching Computing to 3 Reception classes in a formal ICT room with desks and PCs designed for adults, adapting and evolving a curriculum on the fly depending on what’s actually working on any given day… and finding the light switch. Seriously, it took me 10 minutes on my first day to find the light switch in my classroom. In my defence it is in a daft place. And it was dark. I inherited a UK Year 1 (ages 5-6) scheme of work that was all about typing and word processing in the Autumn term. We did do some of that, navigating a QWERTY keyboard labelled in capital letters (why‽) is quite a challenge for those still acquiring reading skills. I wanted to do some coding – but what to use? Scratch is a bit too wordy and fiddly for many in Year 1, ScratchJr requires tablets and I currently only had Windows PCs. We have no Beebots nor the space in the ICT room for a whole class to use them. I asked on Twitter what web or PC-based resources might get the youngest children assembling some kind of code… and the silence was profound. So I decided to invent my own. In Scratch, of course. Now this still needs a lot of work, but I taught my first lesson with this today and I have to say it kept a class of Year 1s engaged for almost an hour. The aim is to navigate an animal towards randonly-placed food by giving the computer sets of instructions in the form of directions. Don’t like dinosaurs? Click on the animal until you find one you do like. The yellow blocks are the instructions. Click on the 1st column blocks to make get arrows in different directions and click the ‘go’ button. When you reach your target, you are rewarded with a point, a round of applause and a new random food to catch. You can press D to display the date, N to enter their name and screenshot & print for evidence of progress. Before we started, I explained the lesson and one 5 year old girl said ‘are we going to teach the computers?’ – I could have punched the air. Another, unprompted, talked about sat navs helping us find our way round – another example idea I hadn’t thought of. But he was 6 years old. I was worried this simple activity would not last 20 minutes, let alone an hour, but they were really engaged with it for the whole lesson, I had to tear some away from their screens. Scores varied from 0 to the high 20s. The pupil who got 0 admitted to being frustrated – she found manipulating the adult-sized mouse difficult but she got tantalisingly close to the target at the end of the lesson – with some support she did not give up and was happy to tell the rest of the class how challenging it was. Another pupil scored only 4 but I was immensely proud of him for sticking with one challenge that was driving him, literally, round in circles. He was so proud when he finally cracked it, and we had a class discussion about there being many ways of solving problems which can be different but all valid. Sound familiar? Look at Stack Overflow. Actually, kids, don’t. They came up with lots of great ideas for improvements: more choice of animals (specifically velociraptors and bush babies! ), a ‘clear’ button, more targets you have to reach in order, making the coloured lines more distinct, speed the game up (click ‘go’ too soon and it goes a bit crazy). 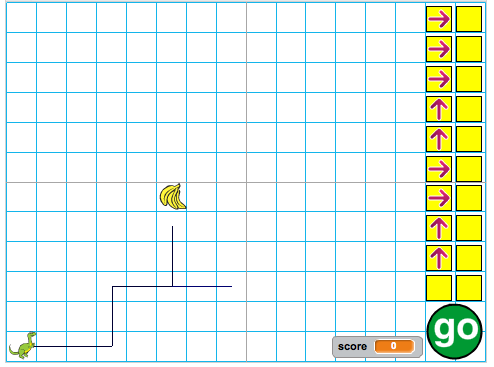 About half the class liked my idea of maze-type levels, but I think the freedom to plough your own route leads to a fascinating diversity of route solutions from the children and the possibility of challenging them to produce more efficient routes with fewer blocks of code. Year 1 came into my class today asking if they were going to do some more typing. They left having begun to understand of of the fundamental ideas behind programming, giving computers very simple sets of instructions in order. A second Year 1 class found this game much more challenging, and the version now embedded at the top of this post has been tweaked according to their suggestions. The animal is placed in the middle of the grid (ish), making it in some ways easier (you can reach it in 9 steps up or down) but more challenging and interesting because you may have to go in any direction, not just up and right. Fascinating how two classes in the same school, not setted or streamed, can react completely differently to the same task. The latest version of this project (embedded at the top of this page) is further improved with ideas from more Year 1 children. Five year olds are way better at designing these things than grown-ups, and I really wish I’d been able to cook up a multi-player version – one day, one day. But this new version 3 has added maze levels. Get 5 points, you get a maze, 10 points a new maze, and 15 points you get yet another. I’ve also changed the behaviour so that the arrows won’t move the animal unless they have numbers associated with them. There are often still different ways of reaching the target, but this should be much more fun to play. 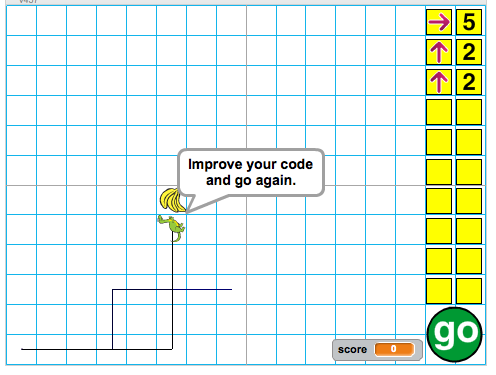 This entry was posted in computers, education, ICT and tagged algorithms, Computer Science, computing, KS1, scratch. Bookmark the permalink.